Asa Dunnington is no stranger to a world of controversy. With family members who served as henchman for Al Capone and some who hauled booze during the prohibition era, Dunnington comes from a long line of fabled characters. 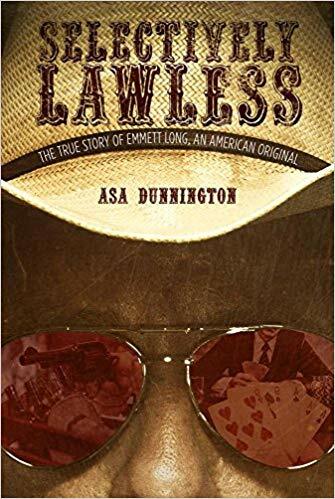 Thus, he was the ideal author to reveal the untold story of his uncle, an outlaw turned philanthropist in Selectively Lawless: The True Story of Emmett Long, an American Original (Brown Books Publishing Group, November 2018). 46 years ago, Asa Dunnington listened to the unforgettable adventures of Pretty Boy Floyd and Bonnie & Clyde, how his uncle Emmett killed five people, robbed banks in broad daylight, and successfully ripped off Caesar’s Palace for half a million dollars. Yet it wasn’t until after Emmett Long’s death that Dunnington finally transcribed the entire story. In this true account, a legend of a man comes to life who made his own rules and broke them whenever it suited him. But Long’s story doesn’t end in the typical mobster way; later in life he pursued philanthropy and religion, eventually becoming a pillar of his community. Similar to his illustrious uncle, author Dunnington has lived his own storied life, from writing for a newspaper to serving in the Air Force to working on a Presidential campaign. Both dreamers in their own right, Asa Dunnington, like Emmett Long, believes in achieving great things, whatever your calling may be. For more information visit www.selectivelylawless.com for more information. This entry was posted in Award, celebrity, honoree, Recognition and tagged Asa Dunnington, author, Today's Honoree. Bookmark the permalink.